An impressive showcase of futuristic developments and glass-and-steel meeting rooms, the Ekovest Berhad sales gallery on Jalan Gombak bears little resemblance to the finance company branch that once occupied its location. And yet, we’re told by Tan Sri Datuk Seri Lim Keng Cheng that much of the original building was left intact during the gallery’s construction. 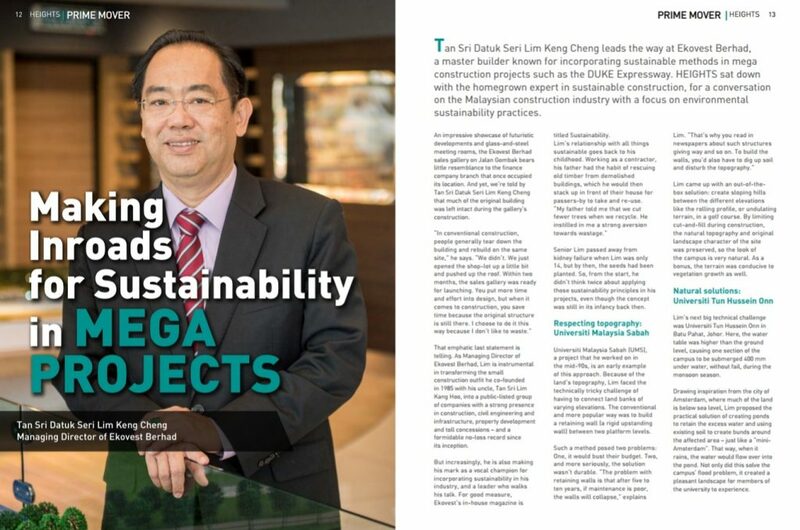 In my first piece for Heights, a publication that highlights game-changing trends, international best practices and the latest initiatives in construction by Malaysia’s Construction Industry Development Board, I interview Tan Sri Datuk Seri Lim Keng Cheng, Managing Director of Ekovest Berhad, about his journey in establishing the company’s reputation as a master builder known for incorporating sustainable methods in mega construction projects such as the DUKE Expressway.